If your laptop is failing to boot because of a crashed hard drive you need our help. We provide professional recovery for all models of laptops, notebooks and portable workstations and are experts in Mac OS X, Windows and Linux operating systems. Take advantage of our FREE courier collection with analysis. Laptop disk drives are a lot smaller than those found in desktop computers. Typically, the disks will be 2.5 inches across – a ubiquitous size which is much more compact and lighter than a chunky 3.5 inch desktop drive. While these have a far smaller physical footprint than a desktop model, they tend to have less capacity, less speed (measured in RPM) and be more fragile. For ultra-compacts, the hard disk can be smaller still – the 1.8″ size is common in top-end prestige laptops and you can even find 1″ versions in some premium models. These are more vulnerable than their larger 2.5″ cousins, partly because they are physically much lighter, with thinner “armour” and less space for components and cooling effects, but also because far fewer of them have been manufactured and so the inherent problems continue to be designed out. 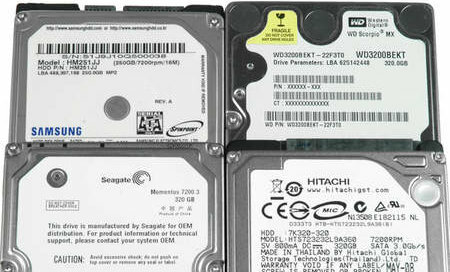 As manufacturers have developed smaller drives, so they discovered and invented ways to make them more robust. One example is the use of accelerometers to detect when a drive is falling – the spinning drive then parks its heads off the media, hopefully before the point of impact. Not all hard disks have this feature, but by their very nature, all laptop hard disks are at risk of being dropped or twisted while performing read and write operations. We have seen laptops dropped on runways into puddles while the owner sprinted for an aeroplane connection, we have seen them used as thrown munitions in domestic squabbles, we’ve seen innumerable examples yanked from owners when a passer-by walked through the cables. In these examples, the drive was no longer visible in BIOS when the machine was booted and in all these cases, we recovered the data. 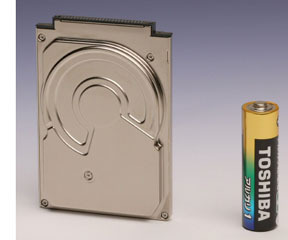 Modern laptop drives tend to be very robust, but also experience a more rugged environment than a desktop computer. Each manufacturer has their own idiosyncrasies, but it’s fair to say that innovations in any single drive technology tends to eventually spread across all the big names. Laptop recovery is a different beast to desktop recovery – the components are smaller, the range of internal design implementations larger, the characteristics for disk failure are different and the market for critical spare parts more elusive. Most people have run through obvious checks before they call us to eliminate the possibility of the process being trivial. It’s fair to say that by the time we receive your hard disk, it has usually been declared “dead” or “terminally faulty” by your local computer support. We recover files from dead laptop drives for computer support companies around the country – we are the reason they are able to claim to offer data recovery. For our part, our investment goes into continually improving our techniques, building our own custom tools and researching new technology. All work is conducted in our own labs by our own technicians, we do not outsource. If we cannot rescue your files, nobody can. We provide national UK coverage to both business clients and home users. If you are in a hurry, we also offer Emergency Service. Standard Service recovery analysis is normally completed within two working days after arrival at our labs. We understand your need for absolute privacy and we treasure your confidentiality as if it were our own. For extra assurance, we can provide you with an NDA. Your rescued files and folders are kept secure and safe and are securely wiped once you have your data safely in your hands. Reach us using the Contact Form, or contact us at [email protected] or call now on 0800 999 4447 or 0131 215 1282 and we can organise a courier collection service. For more information on recovering files from your laptop take a look at our FAQ or email your question to us. "A big thank you for the excellent service provided. You recovered all my essential data, and turned everything around very quickly (without charging a premium price). I am very happy with the service I received."